For 30 years the 'bible of the biz' has received praise from industry professionals, educators, and celebrities. As a guest faculty member at the Circle in the Square Theatre School, she advises the second year students about career preparation and monologue auditions. She was the dean of students at the Tom Todoroff Conservatory. For several years she also has been the industry showcase consultant for the New World School of the Arts in Miami. She has been a board member and V.P. of Programs for the League of Professional Theatre Women (www.theatrewomen.org) and is head of their heritage program. In 2013 she founded the Society for the Preservation of Theatrical History which produces a program about famous actresses of the past entitled Stage-Struck Sampler. An eight-minute clip of the first program at the Snapple Theatre Center can be viewed at the website: societyforthepreservationoftheatricalhistory.com. Facebook page: facebook.com/SPTheatricalHistory Blog: www.howtobeaworkingactor.blogspot.com. She earned her BA in Speech and Drama at San Jose State University and a master's degree in theatre from the Catholic University of America in Washington, D.C.
Mari Lyn Henry was honored on March 25 with a special award from the League of Professional Theatre Women for her contributions to the industry. 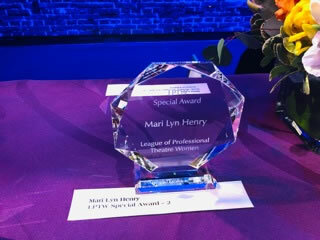 Tonight I will be playing the role of the brief but spectacular "Presenter of the LPTW Special Award to Mari Lyn Henry". Casting, of course, by Mari Lyn Henry! Thank you! I have been in rehearsal for this part for about 10 years now….yet I still feel shaky on my lines. No one could possibly encapsulate all that is Mari Lyn in two minutes…. and those of you who know me know that a two minute limit is particularly challenging for me! Since time is of the essence, I will introduce our esteemed awardee in a time honored Irish rendition! Have you heard of the gal from the Golden State? Her passion for performing began at 8! Catholic U and Helen Hayes too! she's here till this day! and ain't we lucky to have her! as best wishes we send. I want to thank the League of Professional Theatre Women, co-presidents, executive committee and the board of directors and the membership for this special award. The road to parity is paved with wonderful inspirational memories of the amazing women who have supported me on my journey. Beginning with my mother who for over six decades was my best friend. So often she reminded me that 'beauty is as beauty does'. Sister Marie Charles, my eighth grade teacher told my mother. "Mrs. Henry, Mari Lyn will either be famous or infamous…. The vote is still out on her prediction. 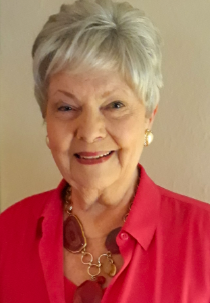 Dr. Ruth McKenzie, my drama lit professor at San Jose State who encouraged me to apply for a scholarship at the Catholic University of America. I didn't get it but I was accepted to the grad program. At the university I was introduced to Father Gilbert V. Hartke, who considered all of us his 'kids'…It was because of him, I was cast to play a role in Good Morning Miss Dove opposite Helen Hayes who became a lasting influence and role model. Helen had a crush on Father and was particularly inspired when we were offstage in a circle of prayer about loving what we were doing and sharing that love with our audience. It was through him that sixteen of us were sponsored by the State Department for a six week tour beginning in Israel of Ah Wilderness!, being invited to the White House by Lady Bird to perform short scenes in the East Room. And attending a reception hosted by Golda Meir at her home in Jerusalem. Maxine Marx, my boss in the casting department of an ad agency, the daughter of Chico Marx. There was never a dull moment. After nine years my dear friend from Catholic U. days who worked at ABC arranged for me to be interviewed for a new position as inhouse casting director for the soaps. Another woman who believed I could succeed. But there was also an extensive collaboration lasting 25 years with co-author Lynne Rogers. Together we produced five editions of a book with the objective of helping actors find jobs. Helen Hayes believed "the most marvelous life training course I can think of is the theater." I can also identify with her belief that 'if you rest, you rust. My bones may creak a little but mercifully rust hasn't set in yet. And finally, this inspirational quote from George Bernard Shaw which she embraced and is meaningful for all of us here tonight. "I want to be thoroughly used up when I die. For the harder the work, the more I live. I am of the opinion that my life belongs to the whole community, and that as long as I live, it is my privilege to do for it whatever I can. Life is no brief candle to me. It is a sort of splendid torch which I got hold of for the moment and I want to make it burn as brightly as I can, before handing it on to future generations." Thank you for this honor and congratulations to all of these amazing awardees and presenters here for their contributions to the theatre. And to all the women who stage the world!